I had a pretty good day today. We just got back home from Walmart and A Chau Oriental Market. I got 3 lbs of shrimp and mussels. I want to add white wine when I cook the mussels tomorrow hopefully it will taste yummy! Well, I didn't do much stuff today my eyes are hurting really bad so I did not drive the car this afternoon. Anyway, tomorrow is Memorial Day and I'm sure a lot of you are having your friends over. I just remember my husband's friend Rick and Rebecca are getting married this week and we are invited. I am excited for the reason I can visit another Asian store in Springfield. With the weather getting warmer now is the best time to remodel your home. Remodeling your home and adding fixtures adds value to your home. If you’re planning to remodel your home, exterior shutters are great features to add to the value and outside of your home. Larson Shutter Company has been in business for many years. They have the widest selection of exterior shutters with different styles and colors to choose from and of great quality as well. Whether you like the classical Victorian Style shutters, Ranch Style shutters or a Modern Style shutter they have whatever you may need. Take advantage of their limited free shipping on orders over of $199 to help you save even more money on your purchase. Larson Shutter Company is an accredited business by the Better Business Bureau so you have nothing to worry on your online transactions. Do yourself, your house and your investment all a favor today. I am a little disappointed for the last few days now. I don't have any tasks to do and I really don't feel like updating my blogs but I have to. Well, I had a pretty good day today. I drove our car and I'm still confused about the reverse thing when I drove today. I know I need to practice more in driving the car so I can take the driving test so I can have my driver's license. Anyway, tomorrow we are planning to visit Crystal Bridges in Bentonville and my husband has heard positive feedback of the place. I am not really a big fan of looking inside the museum but I would be willing to give it another try. So far we are all enjoying my husband's summer break from school and it is 3 months long! When you have your Sunday paper you will notice of their weekly ads or when you visit the store. Yes it is very enticing when you see their ads buy one get one free or buy one get one 50% off. I am not a Walgreens shopper so the other day I told my husband to stopped by at Walgreens because I was interested in what was on an ad, plus I have my coupons as well. While browsing the products that were on the ads I was shocked how overpriced their Dial body wash was. Matter of fact all the products they have in the store were priced higher then Walmart. I don’t see any savings in their buy one get one free ads so I decided not to purchase anything. I’d rather use my coupons at Walmart plus most of the items that I bought I’m planning to send to my family back in the Philippines. The products I bought were on rollback price so I had some great deals at Walmart. With summer coming up my husband, Doug and I have a lot on our plate. We are either going to move to a new house or stay in our old house. We have been looking very hard the last couple of weeks for somewhere we can both agree on. If we do not find the right place though we will stay were we are. Fact is though that no matter where we land we will either remodel where we are now or fix and correct things where we move to. If you are looking to do real heavy work this summer you need to check out, http://www.bacoent.com/category/190/Hex_Nuts.html. BACO specializes in heavy duty hardware like Hex Coupling Nuts and Wire Rope Fittings. BACO specializes in heavy construction like brides, suspensions, power plants and marine applications. Luckily for use common handy people they also have the same great quality available for light duty house applications as well. I had a great Mother's Day yesterday. 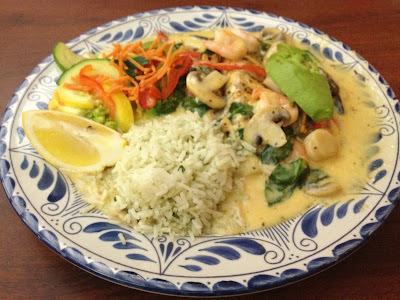 We had our dinner at Abuelo's and finally I took a picture of my favorite entree which is Pescado Guerrero. It is wood-grilled, tender barramundi filets topped with fresh shrimp, scallops, mushrooms, spinach, roasted peppers and sliced avocado in a delicious white wine sauce. We looked on the townhouse that we're planning to move this summer when everything goes really well. I loved that is has bigger rooms, big backyard, more closet space plus two car garage. I can have my own closet and my husband can have his own closet as well. Though I am not a big fan of the kitchen. It has outdated appliances for stove and dishwasher. With small space in the kitchen I don't think my husband and I can cook together. I need an open floor plan from living room to the kitchen and this townhouse is not. Also I am thinking it is a two story townhouse. I can't imagine Charles sleeping upstairs by himself. Since he was four months old Charles is sleeping with us. We are both very interested on the townhouse for the fact that it has bigger rooms and we can have BBQ cookout on the porch. My only drawback is the kitchen. Well, we still have plenty of time to look more houses when the school is over. There's a house closer to us but I think it is much smaller compared to what we are now. Though it is much closer where my husband work on his wrestling practice with the kids. My husband, Doug is a huge military collector. Though he specializes in World War I and World War II collectibles he will actively purchase any military goods he can. Recently he has been building a collection of modern forces gear and equipment. One of the things that he is super excited to get is a Tactical Headset. He claims that this headset will be great fun for him and Charles, our son to communicate with. Doug has been looking for a true military issue headset and has found one of the actual providers of these headsets at, http://www.cjcomponents.com. CJ Components provides tactical headgear, wireless communications, microphones, field phones and a huge array of accessories. CJ Components provides the United States Military and a huge array of special forces from around the world. They also provide gear to police special units. Like icing on a cake they have a final benefits they are all made right here in the United States. I was browsing on the web and the tanning mom Patricia Krentcil from New Jersey is on the news again. The first time I saw here on the Today show with Kathie Lee and Hoda, I did not recognized here. I felt sorry how she looked like. Maybe she needs a mirror to check herself out and find out what she think of her skin. She's burned out and she looked terrible. I don't know why most women couldn't accept of who they are and will do everything just to make them beautiful in such a horrible way. And then she's denying that she never took her daughter to the tanning booth with her. She's endangering her daughter's health and her health as well. Yesterday on Anderson, there was a guy and his face looked burned as well. I don't think the guy tanned himself on the tanning booth but his face is just weird. Anyway, I noticed that my PR2 has dropped to PR1. It is okay I can't really do anything about it. All I have to for now is to keep updating this blog and who knows when I check my PR again it will be back to PR2. Well, I am glad that the guy came early to mow our yard. I grew up in the Philippines and cooking spaghetti and lasagna were very special meal for my family. Now that I am a mom spaghetti and lasagna are my boys favorite meals to eat. I use grated parmesan cheese for my spaghetti meatballs and part-skim ricotta cheese for lasagna. It makes the noodles so creamy and yummy that’s what my boys all love about cheese. Recently I began to put white american cheese as well in my son, Charles and my spaghetti as well. We both really love the flavor of this cheese in our pasta. My sister-in-law, Connie also loves to eat cheeses of all types. She always brings cheese for Charles and though we don’t live in Wisconsin I guess you could say we are all cheese heads. Since we moved two years ago when we travel to Kansas City we no longer pass by our favorite cheese store, Osceola Cheese anymore. We all really miss going there and trying all the yummy types of cheese. Eating a snack like cheese is also important for a women’s health nutrition. Mother's Day is just few days away. For moms out there what are your plans on that day? For me, I would love to eat my favorite Mexican restaurant which is Abuelos. I also got a coupon of 50% off when you buy a second entree of equal or greater value, plus two beverages. I just loved their Pescado Guerrero that is why I love coming back to Abuelos. Well before Mother's Day the most anticipating blockbuster movie of the year, The Avengers will be shown this Friday. All the movie critics love this film and so my husband. The movie will be shown in 139 countries and it has already reached up to 178 million in ticket sales and counting not included here in the United States. I really wanted to watch this movie with my husband but it is difficult for Charles to sit for a very long period of time. It is very different how people here in the United States watch movies at the theater compared in the Philippines. In the Philippines movie goers keep on talking, laughing and texting while the movie is going on which I find very annoying. Here in the United States when you hear a kid crying the parent will take the kid outside and you cannot hear people talking on the cellphone or to other people.